My Penultimate Parish Visitation of the Year! 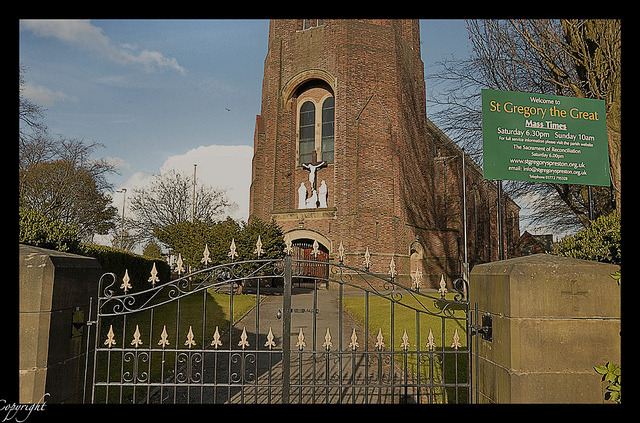 My penultimate Parish Visitation for this year, within the Preston deanery, took place in St. Gregory’s parish, within sight of Deepdale, the celebrated football ground of Preston North End FC, and forever associated with the great Sir Tom Finney. At the conclusion of the Saturday evening Vigil Mass I had the rare but happy task of presenting a papal blessing to a parishioner who had just celebrated his hundredth birthday. 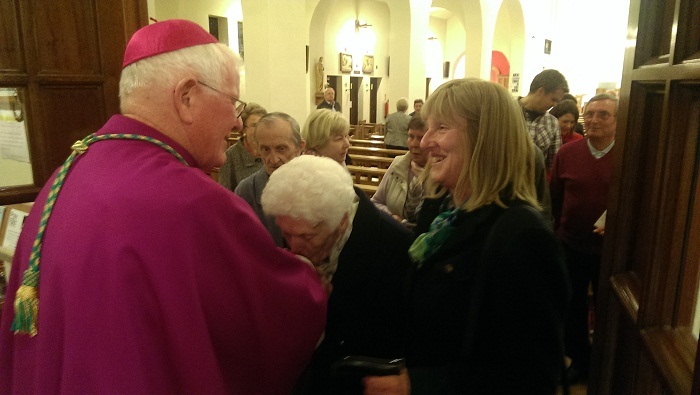 The warm round of applause in the church was richly deserved by this regular Mass-going centenarian on this occasion, a surely remarkable milestone! After the Sunday morning Mass, and meeting and greeting the parishioners at the church entrance, I joined the parish pastoral council and parish priest for an informal and very pleasant parish lunch. 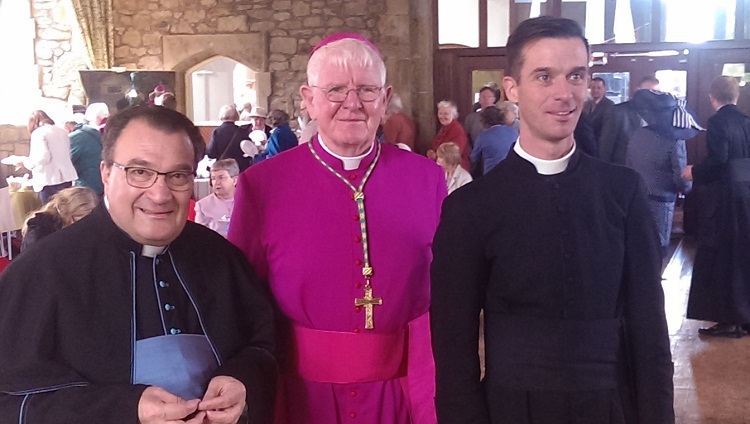 Here I was able to acknowledge the important contribution each of them made to the life of St. Gregory’s parish. 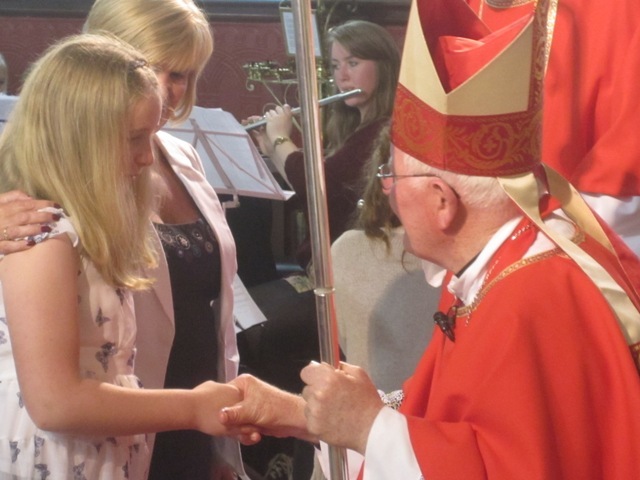 One highlight of the visitation was the Sunday afternoon Mass of Confirmation during which I conferred the sacrament on a group of forty-four, mostly young people. 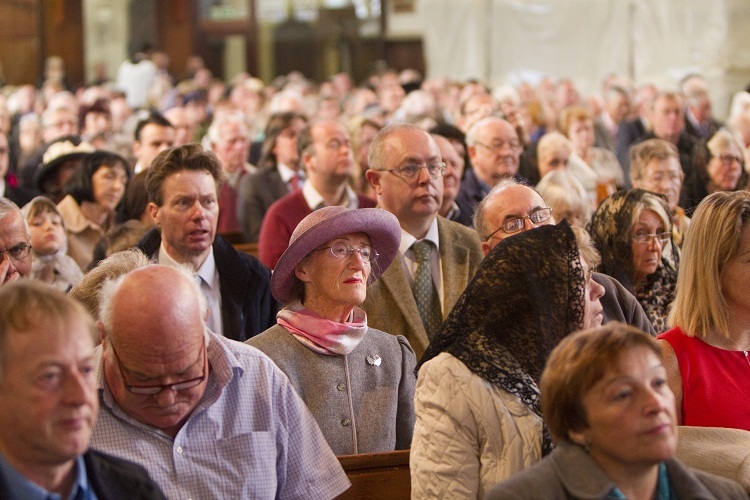 A large congregation of parents, family and friends filled the church for what was an impressive occasion. Those being Confirmed were well prepared and had chosen with deliberation a particular saint’s name as their patron. 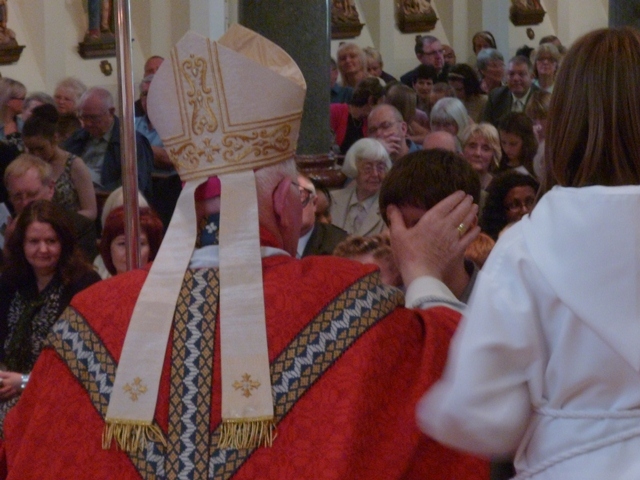 The presence of so many at this Mass brought home to me yet again, as Bishop, the spiritual importance that family and friends of the young people attach to Confirmation. 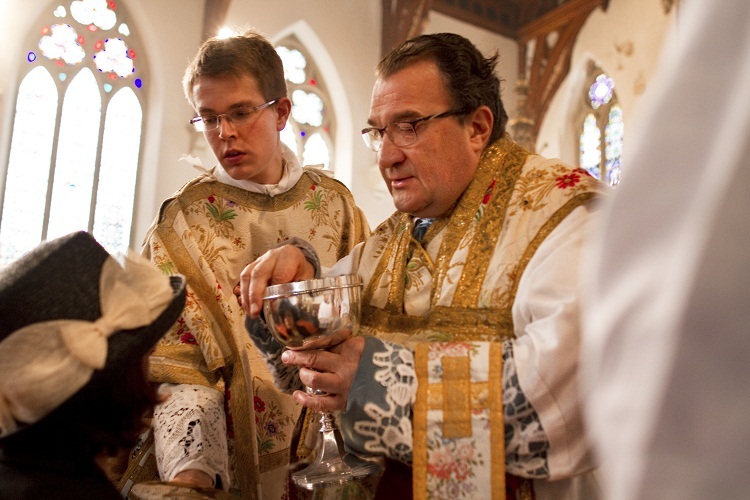 In an often confusing world with so many choices and conflicting values, parents grasp that there is something very special, even precious, about the Sacrament of Confirmation for young teenagers. Their children are receiving the grace of the Holy Spirit as they enter a challenging period of their life. 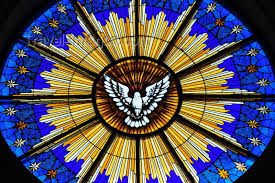 Parents and sponsors have that ‘sense of faith’, as the theologians call it, an instinctive awareness of the presence of Christ and his Holy Spirit coming to rest on their young people as they are being Confirmed. 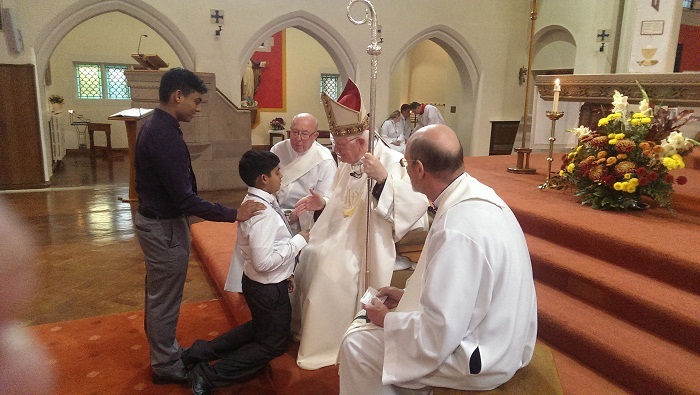 May this Mass of Confirmation live long and vividly in the memories and souls of the young people of St. Gregory’s parish! 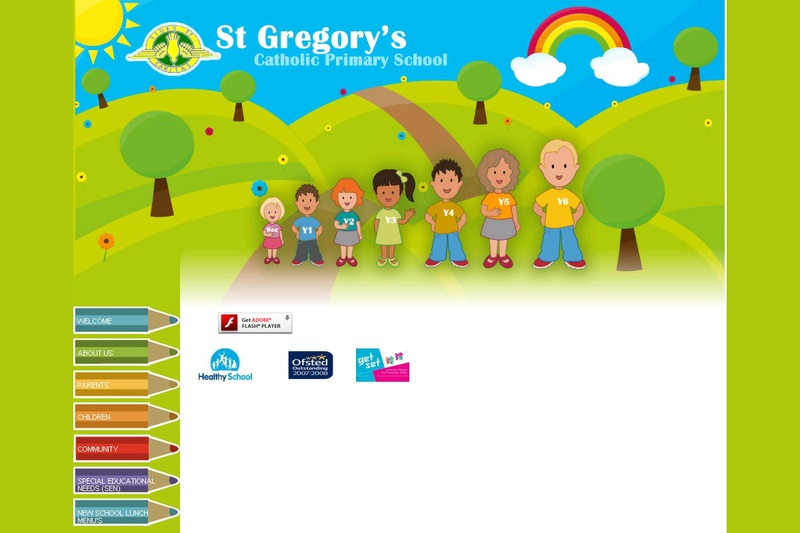 A visit to St. Gregory’s Catholic Primary School, adjacent to the church, brought my parish Visitation to an end on Monday morning. This visit began with a blessing of the new school entrance, a symbolic moment and, as a child remarked, the purpose of the blessing was to keep everything harmful from entering the school. I spent the remainder of the morning touring the building and meeting the different classes of this popular and very successful school. The mid-morning break gave me the opportunity to meet the Head and staff and thank them for all that they are doing for Catholic education in this area of Preston. 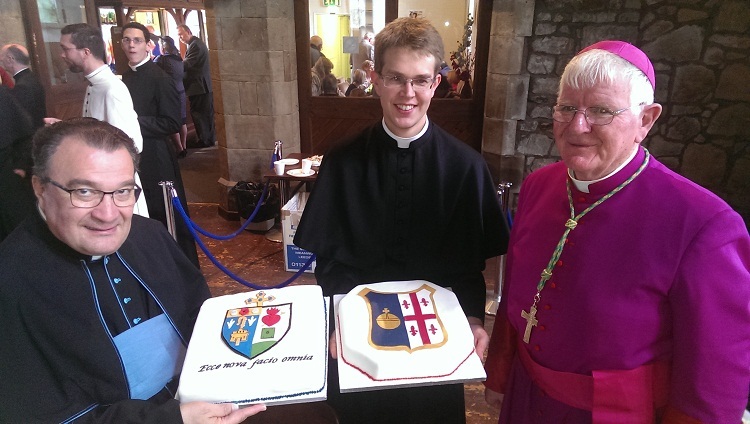 A Busy Week of Visits and Celebrations in Preston, Blackpool & Cleator! 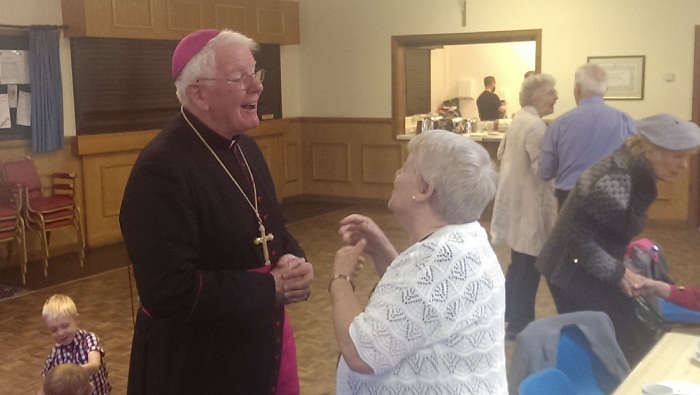 The parish of Our Lady and Saint Edward in Fulwood, Preston, had its turn for an episcopal pastoral visitation last weekend. 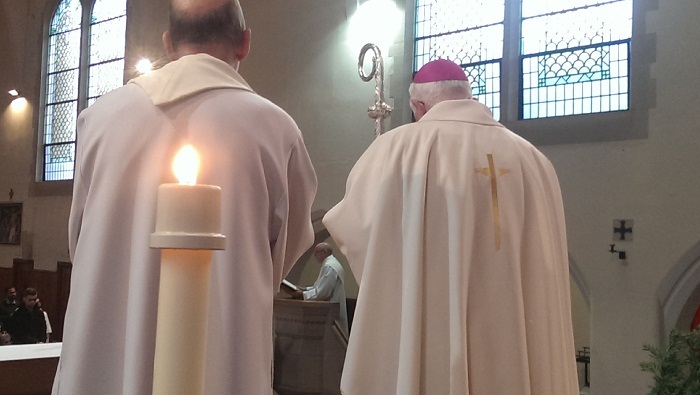 I presided at the Saturday evening Vigil Mass and was chief celebrant at the two Sunday morning Masses. By happy coincidence the parish was celebrating its patronal feast, that of St. Edward the Confessor, which fell on Monday and this added to the joy of the Visitation. Saint Edward’s tomb incidentally is now in Westminster Abbey, an abbey which he helped to found in its initial stages all those centuries ago. 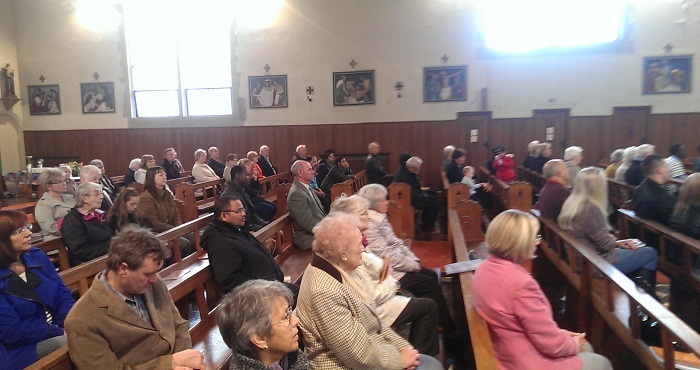 I met with the parishioners after each Mass, and in particular joined quite a number in the parish centre after the 8.30am Mass for the now well-established Sunday parish ‘breakfast’ custom provided by a rota of volunteers. This provides the opportunity for parishioners to relax in one another’s company, enjoy some breakfast, and catch up on the past week. 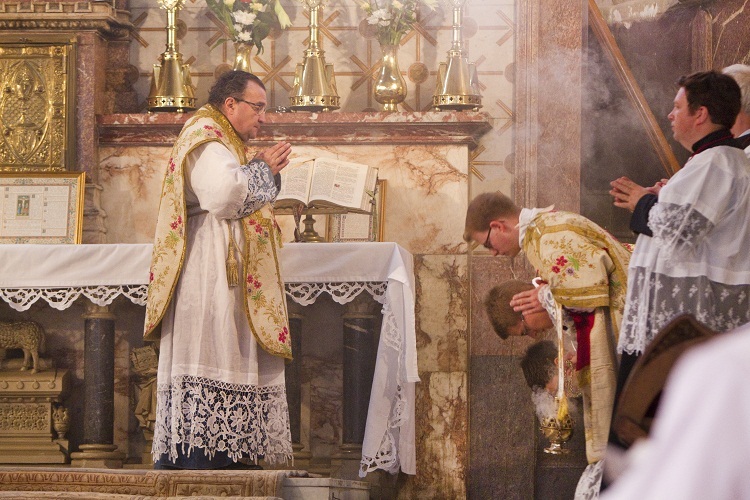 Such a practice makes for an admirable extension to Sunday morning Mass and further strengthens the sense of Catholic unity and belonging among the parishioners. In the afternoon I accompanied the Parish Priest to visit some housebound parishioners, which is invariably a rewarding occasion. 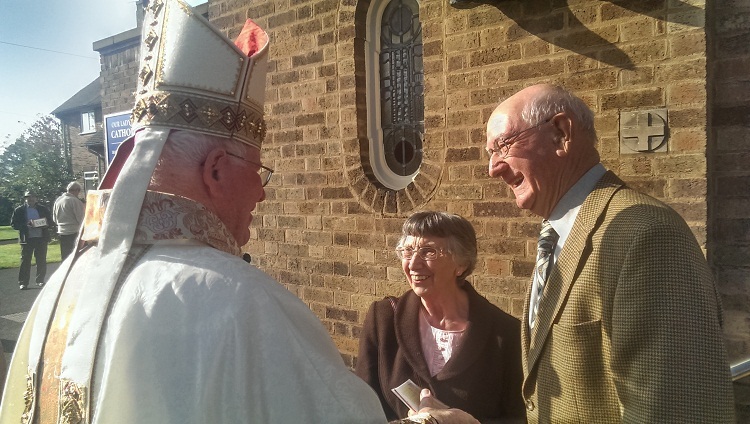 I make a point of reassuring them that they have an important place in the life of the Church, even though they are no longer able to make their way to Sunday Mass through old age or sickness. 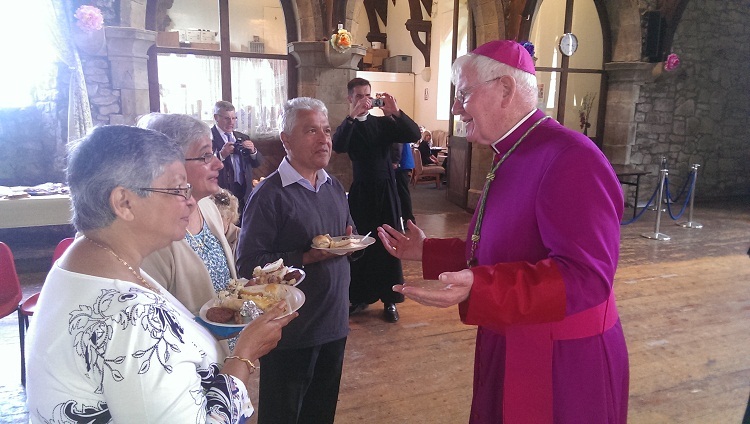 I am always touched by the warmth of their welcome and their pleasure at the bishop’s visit, which I find humbling. 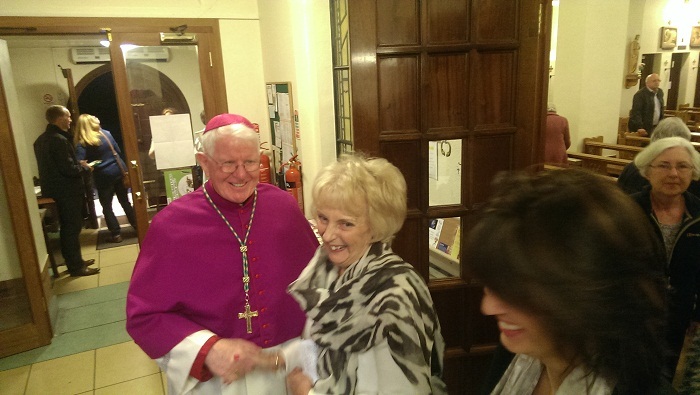 To conclude the parish Visitation I spent Monday morning in Our Lady and St. Edward’s Primary School. 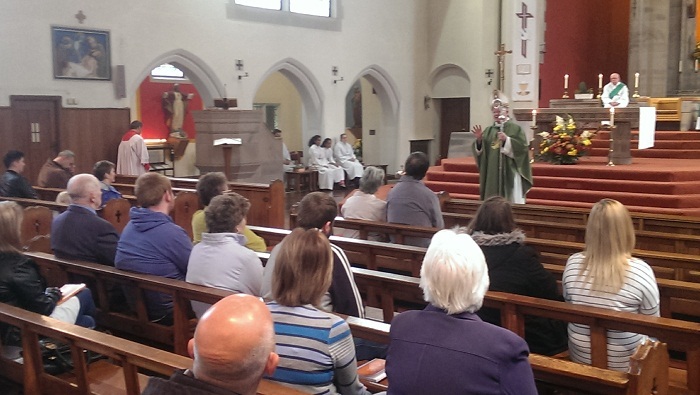 Appropriately, the school assembly was devoted to the life and witness of Edward the Confessor, and highlighted in particular his generosity to the poor. 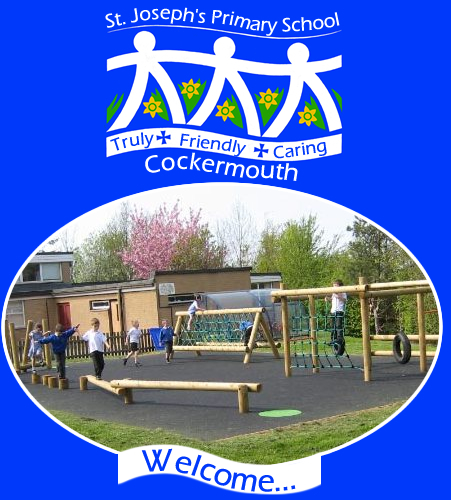 I then met the staff at coffee break and finished by meeting and greeting the children in their different classes. The children were admirably prepared for the Bishop’s visit and the older ones had lots of questions to ask about life as a bishop! 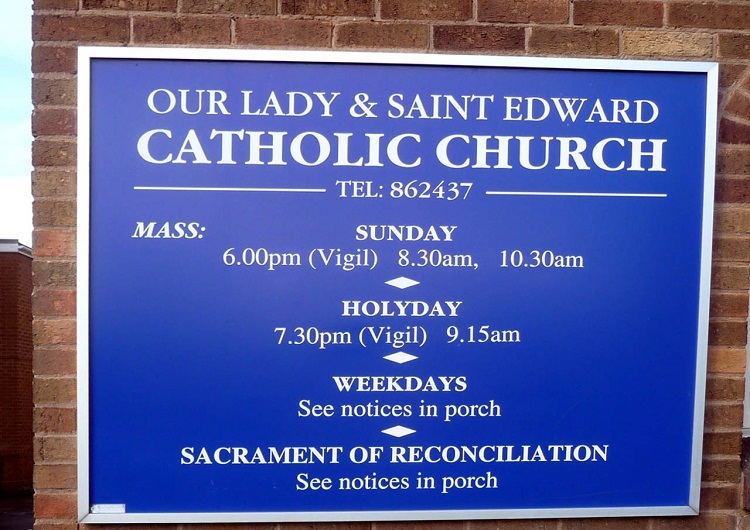 So a highly satisfactory parish and school visitation came to a close, and both parish and school seemed to be in good heart under the sure tutelage of Our Lady and St. Edward the Confessor. 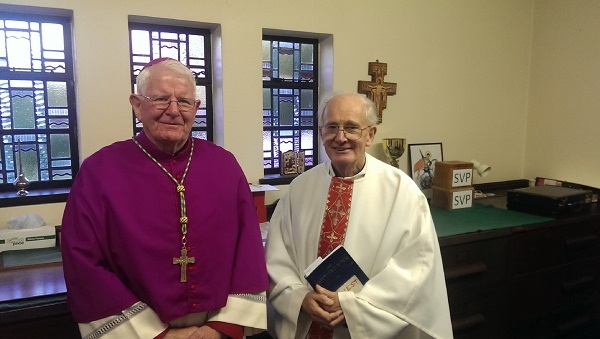 I moved on from Preston to Blackpool, to our retired priests’ residence, St. Winefride’s, in Bispham, to join the Fathers for a small concelebrated Mass in the afternoon to mark the twenty-ninth anniversary of the first Mass being said there. 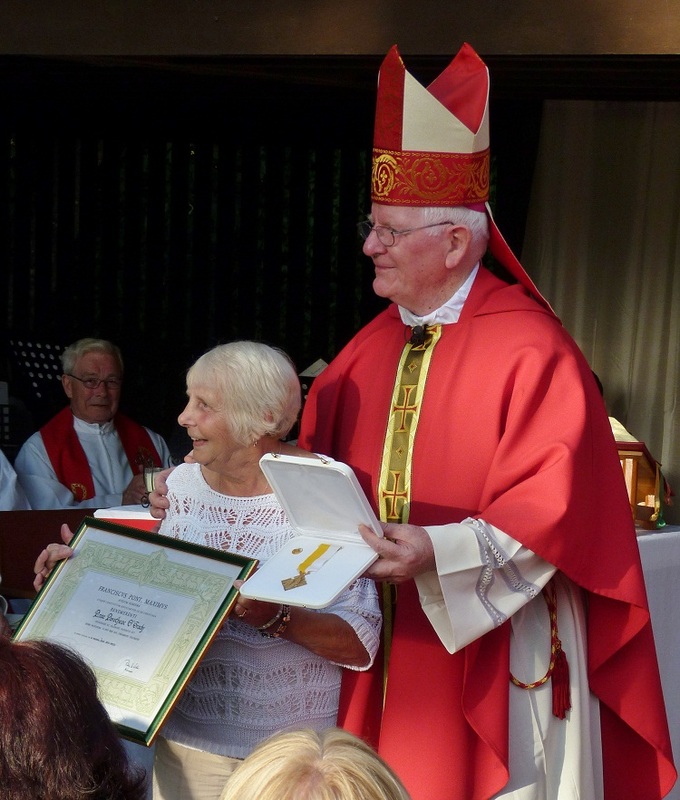 The house was a gift to the diocese by the late Mrs Winefride Place, and was opened thirty years ago by jointly by two of my predecessors, Bishop Brian Foley and Bishop John Brewer. 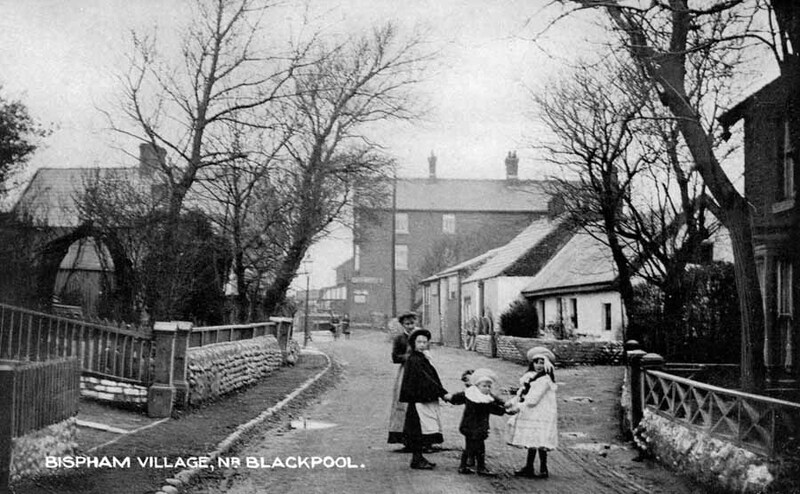 This lovely house in Bispham, Blackpool has served our retired priests well and the diocese is grateful to the many staff and helpers, past and present, who have made St. Winefride’s the true home it has become. 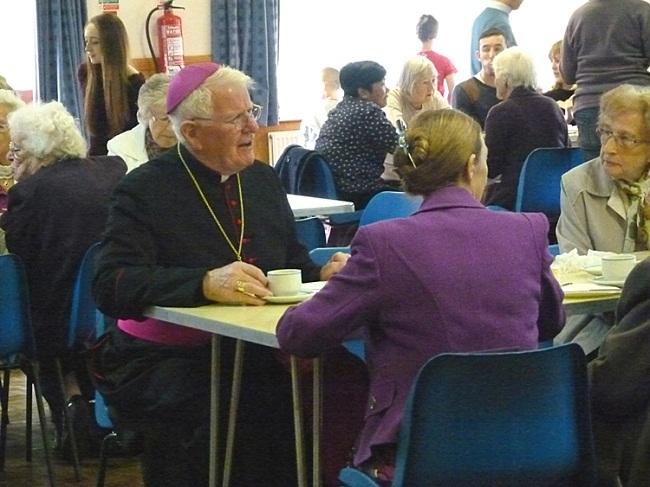 The tea and refreshments after Mass allowed the community and myself to chat and share stories in a very pleasant environment. It was indeed good to be together and be encouraged by one another’s company. 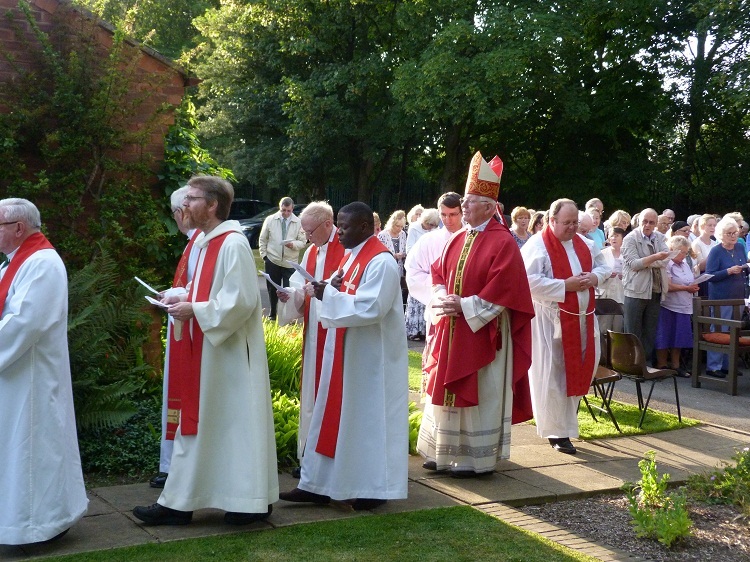 I remembered, too, the Blessed Edward Bamber Mass celebrated in the grounds there in sunny July. 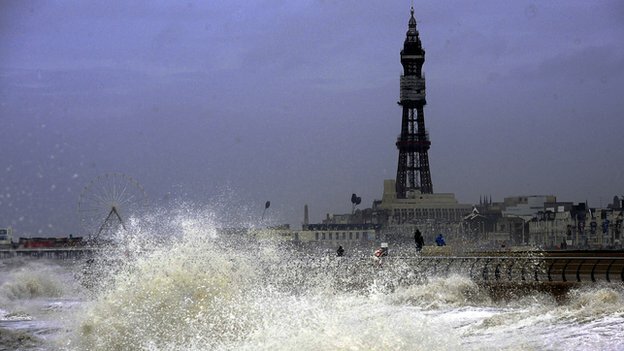 It was back to Blackpool, and Bispham, to St. Bernadette’s Primary School, on Thursday morning, to bless both the new school entrance area as well as the statues of Our Lady and St. Bernadette. 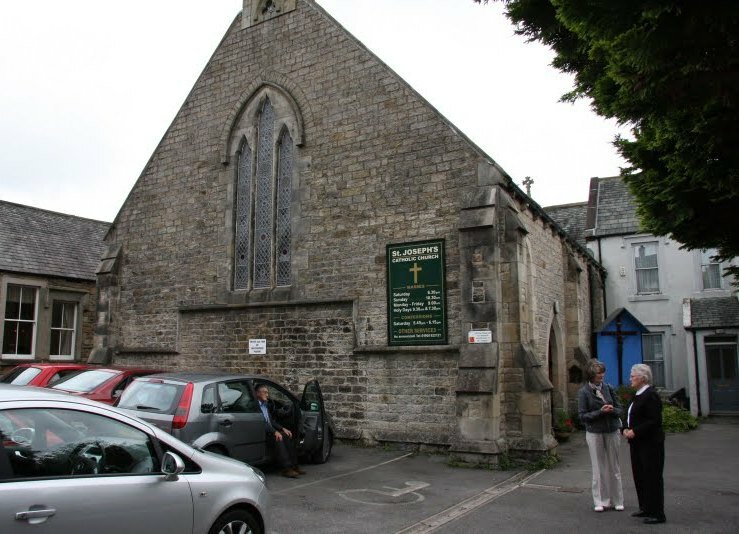 Again, the children in this lovely school were admirably prepared for the occasion and took full part in the prayers and hymns in the assembly worship. 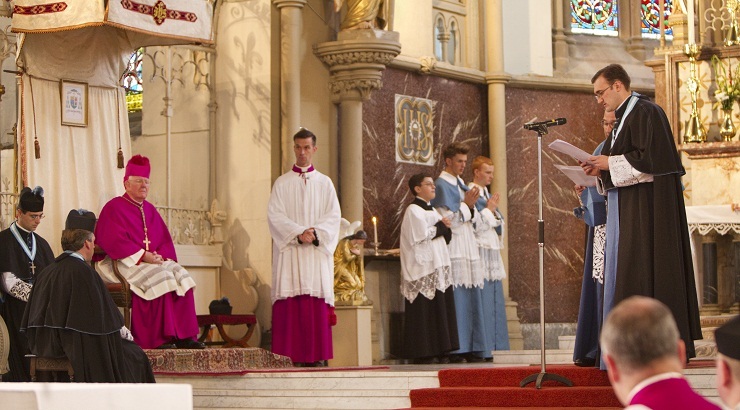 The presence of parents and governors and parishioners added a further pleasing dimension, and the vigorous rendering of ‘Immaculate Mary’ must sure have brought a smile to Our Lady’s face as she looked down from heaven. 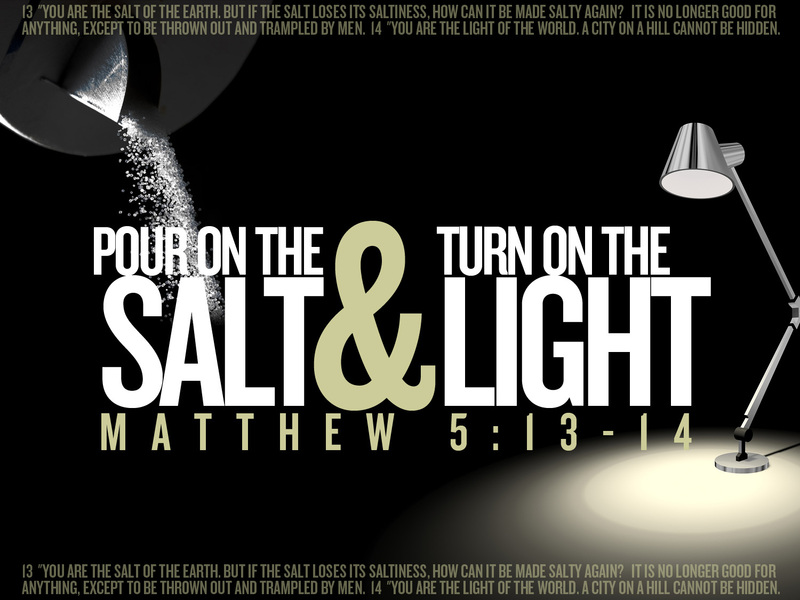 The gospel passage recalled Christ telling his disciples that they were to be like salt to the earth and light to the world, in other words to make a difference. I stressed to the children how that is one description of their school – a place where the love of God prevails and where everyone is important. A welcome cup of tea followed and then a tour of the classrooms to meet the staff and the children in their learning environment. Both staff and children in St. Bernadette’s exuded warmth and it was a pleasure to stop and chat and, as ever, field many questions on what it is like to be a bishop and what do I enjoy most as a bishop! Full marks to our teachers and staff in our Catholic Schools for all they do for the little ones and young people in their care. 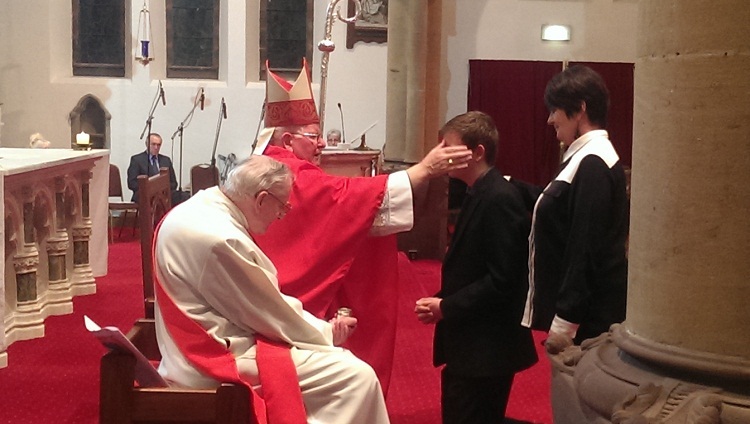 My final engagement on Thursday evening took me all the way to St. Mary’s Church, Cleator, to Confirm over thirty young people from the various parishes in the area – Kells, Whitehaven, Egremont and Cleator itself. 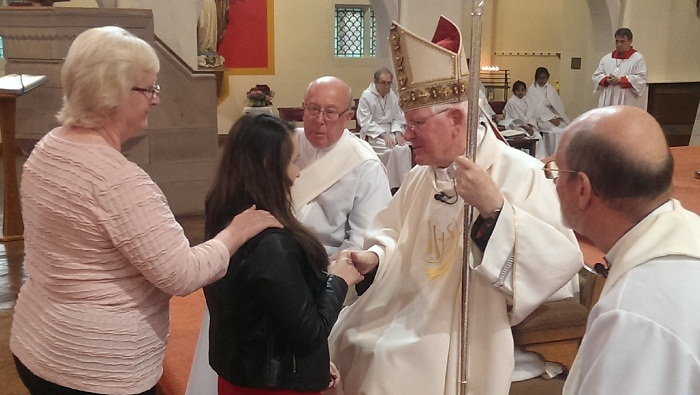 It was a dignified and well-attended liturgical celebration, with the Mass of Confirmation being concelebrated with the local parish priests. The young people had been well rehearsed as they came forward to be anointed, while gratified parents and families looked on. In my homily I spoke of passing the torch of faith on to the next generation, these young people on the point of Confirmation. They would have the grace of the Holy Spirit to enable them to be Christ’s ambassadors along the road of life, and so make the world a better place as God intended. May the Holy Spirit prosper them on their way! 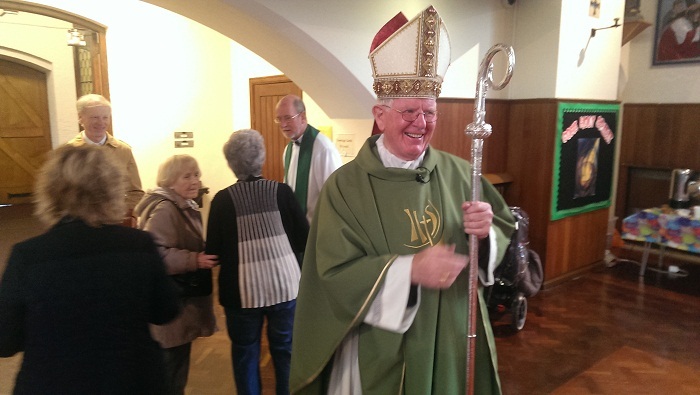 Parish Visitation for Keswick & Cockermouth! 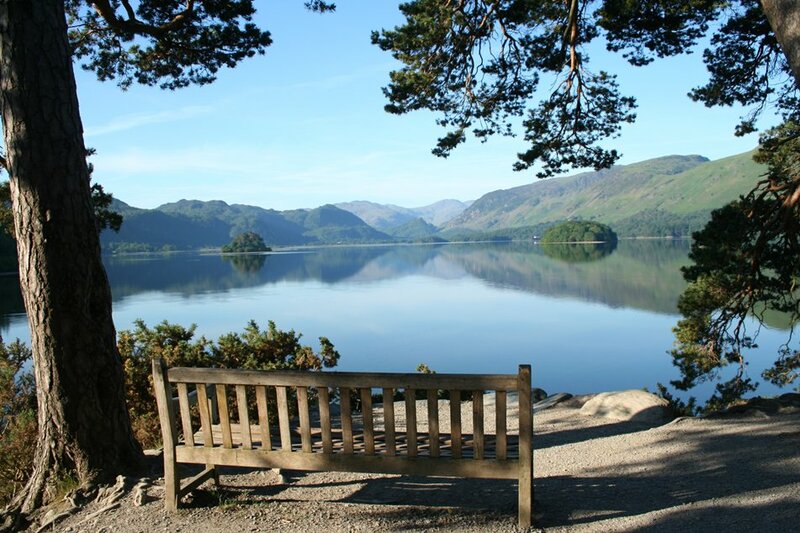 The Diocese of Lancaster is blessed with swathes of beautiful natural countryside, above all the Lake District, and it was there that I went last weekend that on Parish Visitation to the linked parishes of St. Joseph’s, Cockermouth and Our Lady of the Lakes and St. Charles, Keswick. 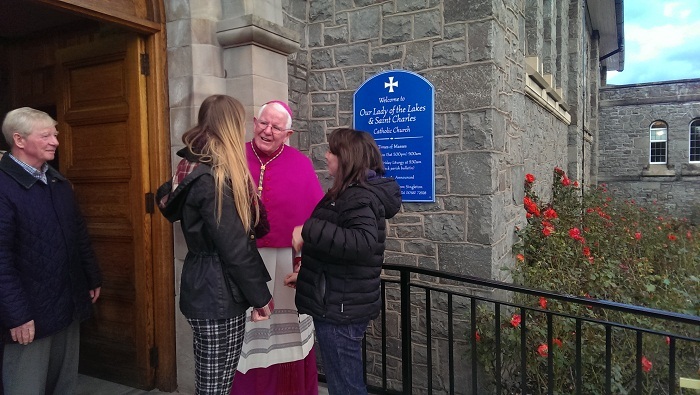 The area attracts holiday makers and fell walkers, some of whom, along with local parishioners, I met and chatted to after the Saturday Vigil and Sunday morning Masses in Keswick. 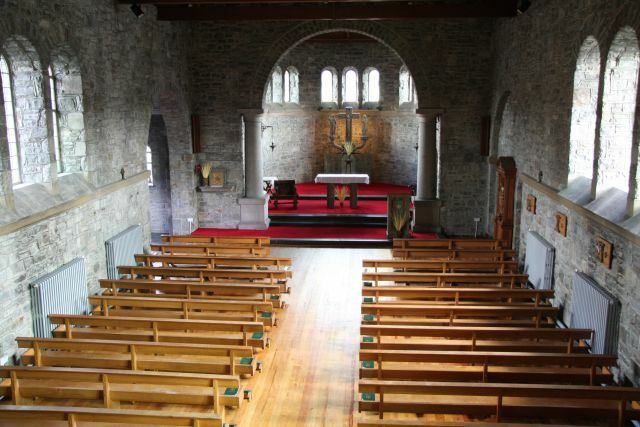 Our Lady of the Lakes and St. Charles church in Keswick is Romanesque in style and its rugged appearance is very appropriate for a Lake District church building. The memories of the floods which so devastated the attractive town of Cockermouth five years ago have gradually receded into the past, and with the erection of new barriers along the river Cocker and a revamped drainage system in the main street, the town is now hopefully protected from future disasters. 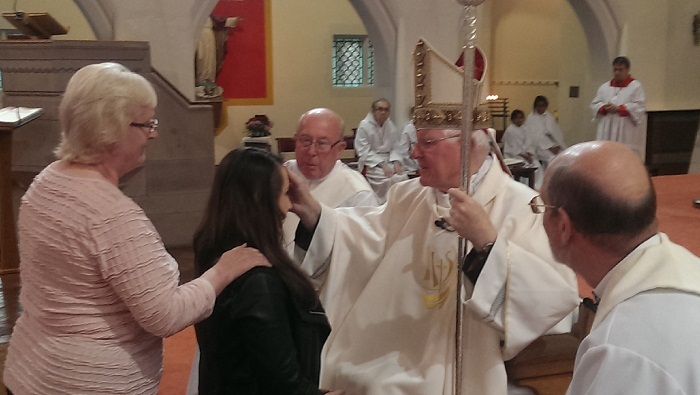 During the Sunday morning Mass in St. Joseph’s church – which was seriously damaged by the floods but now attractively restored – I administered the sacrament of Confirmation to ten young people. 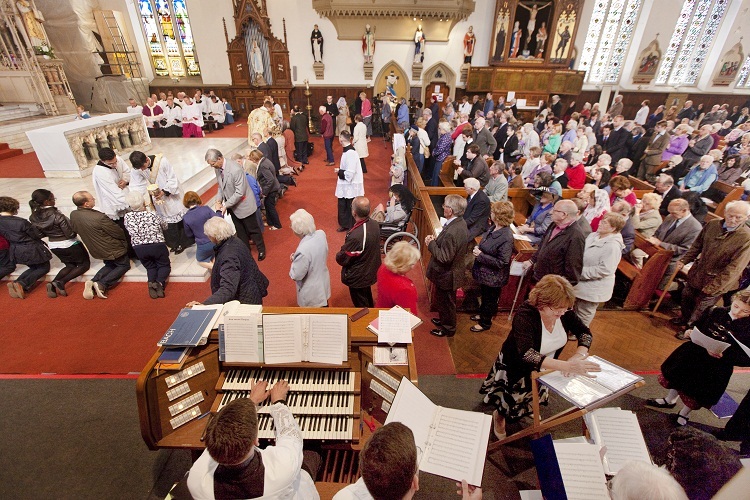 The excellent music which greatly enhanced the liturgy added to what was an occasion of great joy for the newly Confirmed, their parents and families, and the wider parish community with their parish priest. 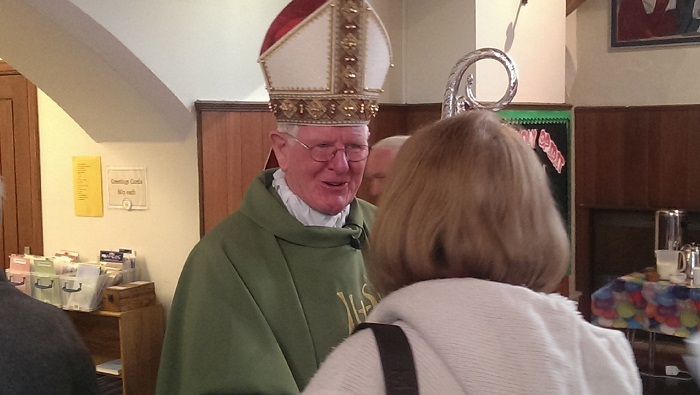 The Catholic community in Cockermouth, though relatively small, is active and vibrant and the Holy Spirit seemed particular present at this uplifting Confirmation Mass. 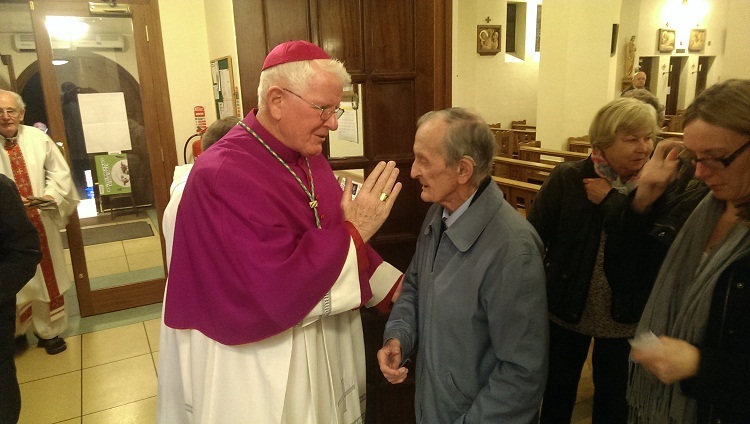 In the afternoon I joined the Parish Priest to visit a number of elderly parishioners, now less able to get to Sunday Mass. 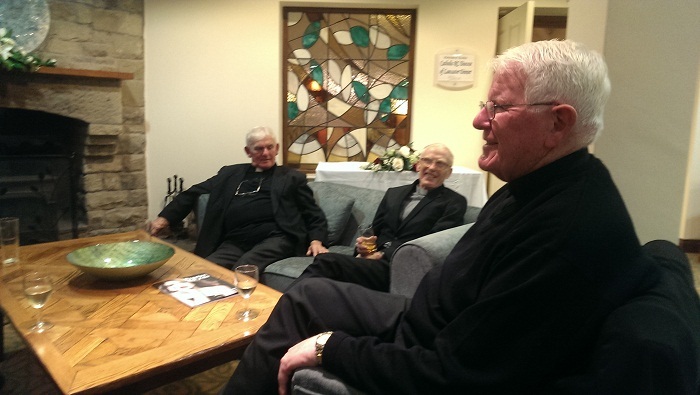 Meeting and talking to them was a joy and a privilege, and their long lives were rich in experience. What proved a pleasant and satisfying Parish Visitation concluded on Monday morning with a visit to St. Joseph’s Primary School. I received a warm welcome from the staff and children, with the chair of Governors. 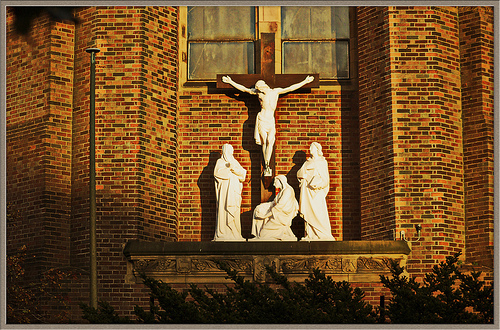 St. Joseph’s is not a large school, around sixty pupils, but perhaps all the more attractive for their small numbers. There are some wonderful photos of the school visit here. My visit concluded with a question and answer session in each of the classes with these lovely children, and brought to a close in Cockermouth and Keswick a memorable weekend in what is a truly delightful part of God’s creation, and where the Catholic faith remains strong. The intervening days of my week were taken up with the monthly meeting of the diocesan trustees, and other committee work. 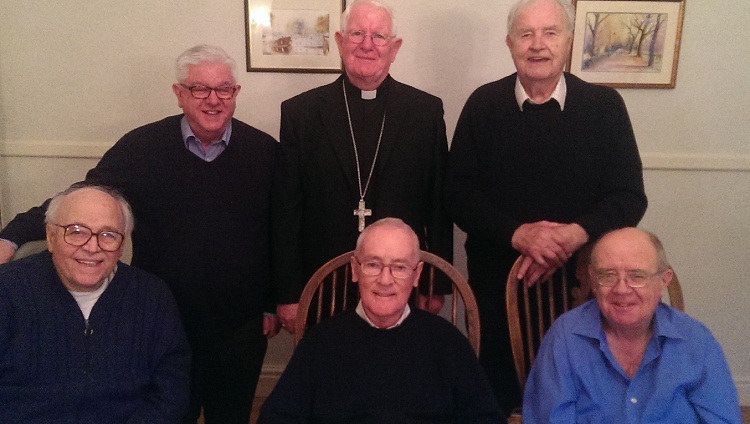 Finally, I had the pleasure of joining our priestly jubilarians for a celebratory meal on Thursday evening and, as bishop, of acknowledging their long years of committed ministry to God’s people in the Church. 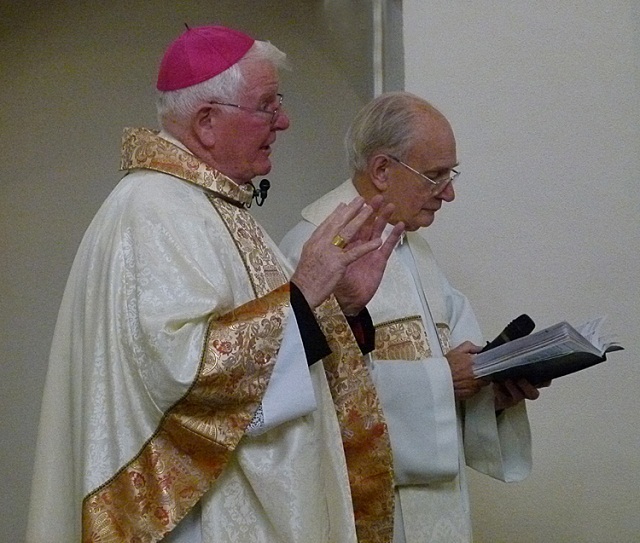 One priest was marking sixty years since his ordination, two others their fiftieth anniversary, and a further two had reached their ruby jubilees, making a grand total of two hundred and forty years of priesthood. 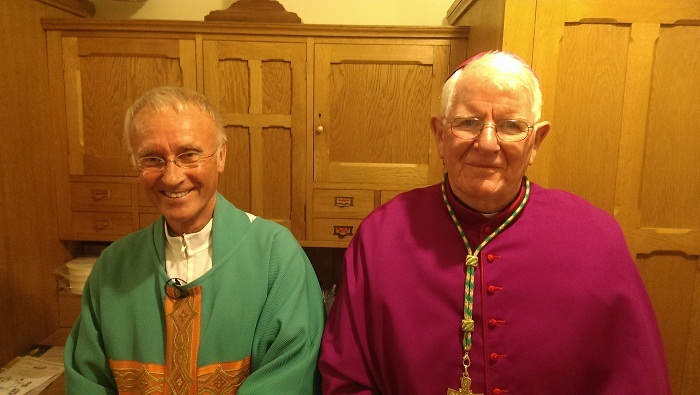 A sense of gratitude pervaded the occasion, enhanced by good conversation and exchange of seminary memories of yesteryear and of their first appointments as newly-ordained priests. 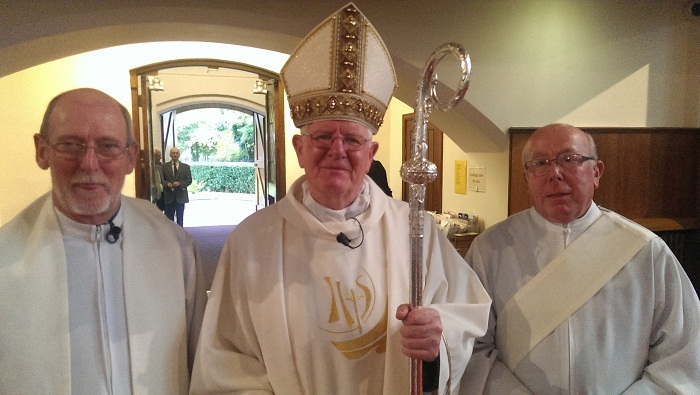 These priest-jubilarians, and so many others like them, have touched many lives in Christ’s name. 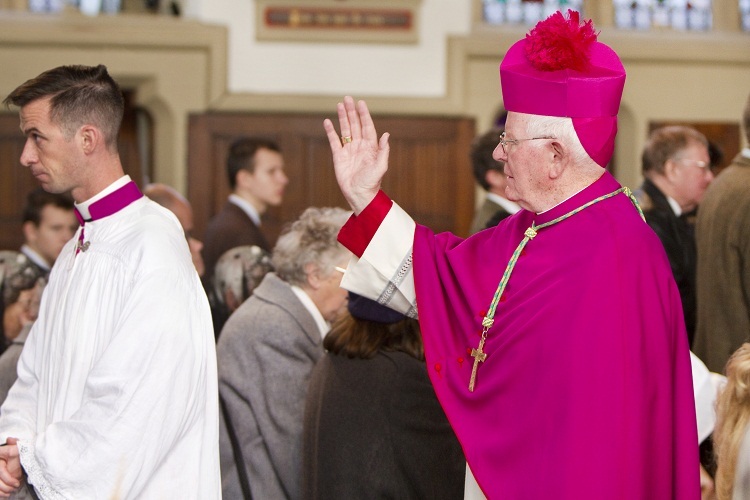 The Church and the Diocese of Lancaster salutes them and is profoundly grateful for their priesthood. 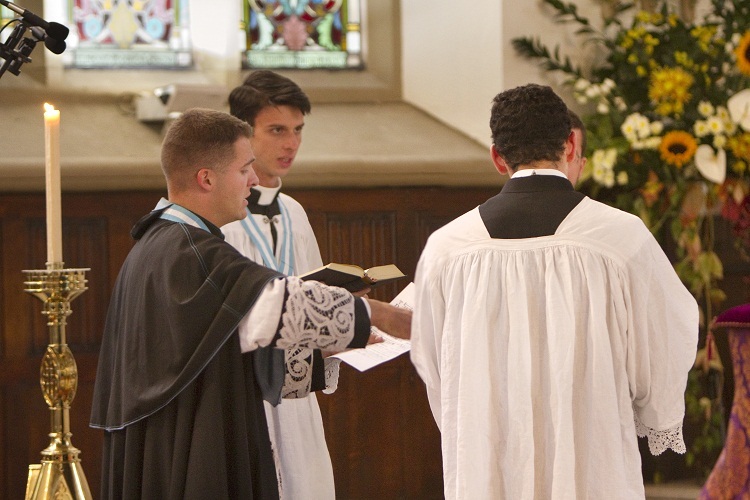 May their witness inspire many new vocations! 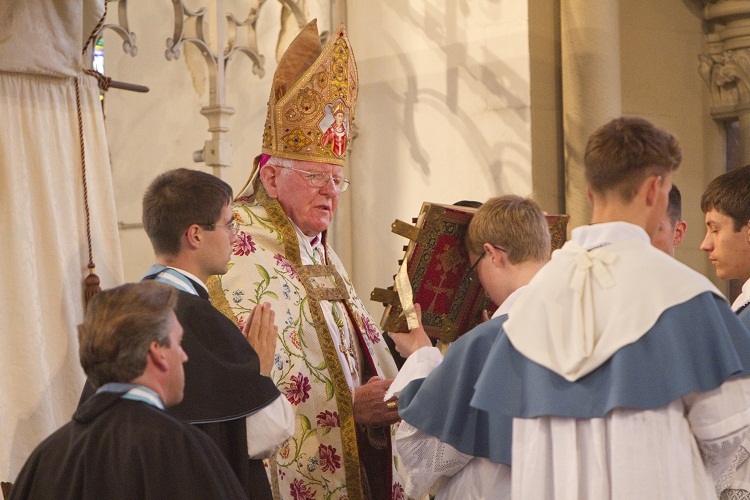 Last Saturday marked an important milestone in the history of the cathedral-like, St. Walburge’s Church, Preston, and the Diocese of Lancaster when the Institute of Christ the King Sovereign Priest assumed responsibility for what has now become a shrine church for the liturgy in the extraordinary form of the Roman Rite. 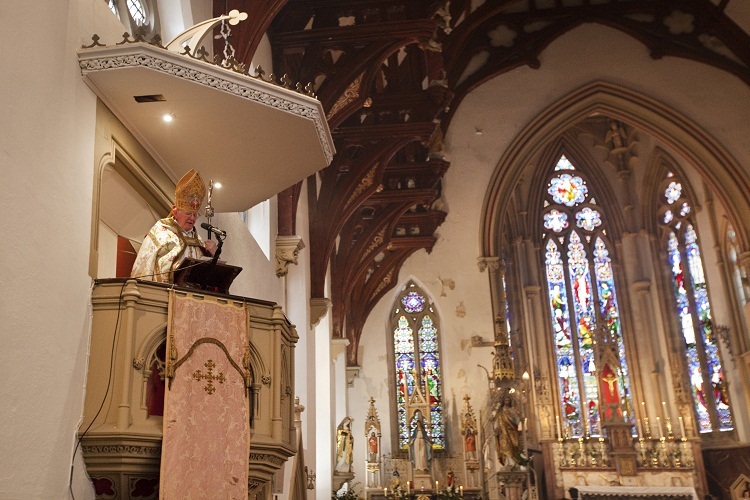 A remarkable congregation of around seven hundred gathered for the opening High Mass, at which I as Bishop of Lancaster presided from the throne and preached the homily. 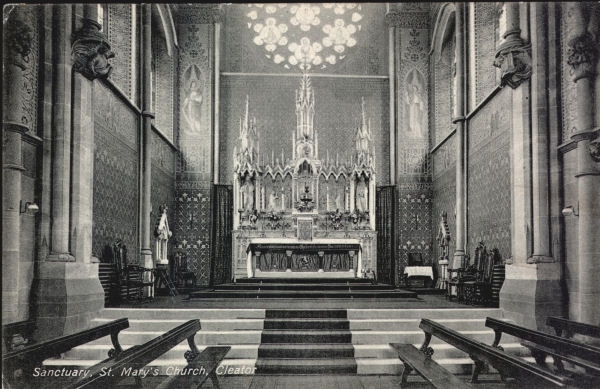 The well-known demographic changes and housing redevelopment in Preston and a proliferation of churches, reflecting the city’s very Catholic past, meant that this splendid church, dating from 1854 was, by and large, now greatly underused for worship. 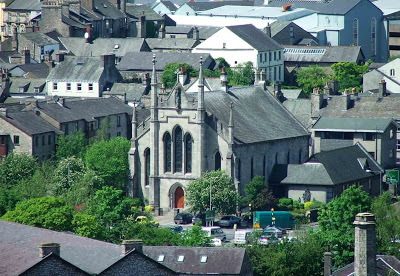 St. Walburge’s had almost become surplus to our diocesan needs, and several previous Bishops of Lancaster found themselves at a loss as to what was the way ahead and purpose for such a fine building in the new situation which had evolved. 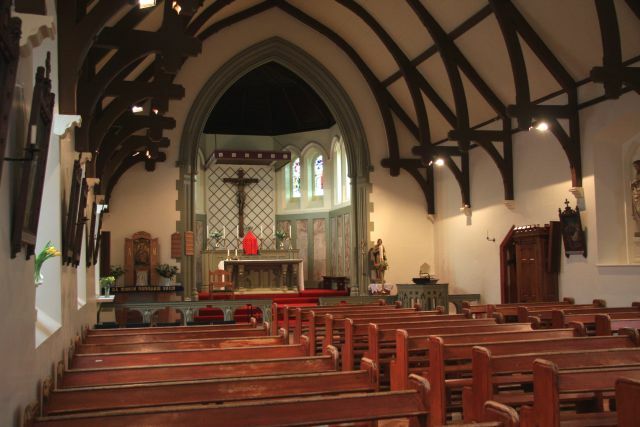 The relatively young Institute of Christ the King Sovereign Priest had a proven track record of taking on large, almost redundant churches, and restoring them for use in the extraordinary form, as has happened in New Brighton, Wirral in the Diocese of Shrewsbury. 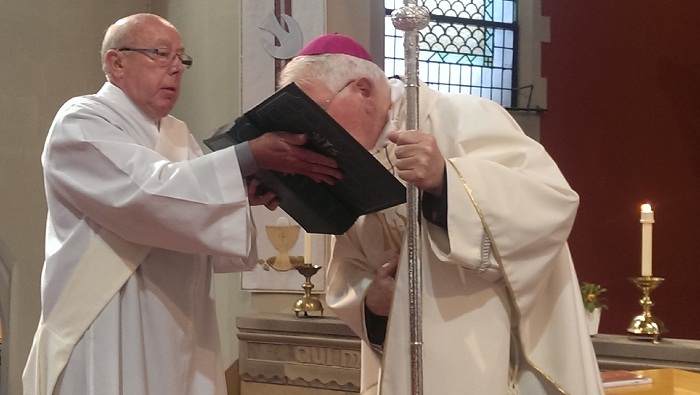 The Institute responded willingly and generously to my personal and direct appeal and Saturday’s opening Mass marked the culmination of a year-long period of care-filled negotiations between the Diocese of Lancaster and the Institute. Here is my sermon for the occasion: ‘The Apostle counsels us today that if we are to boast or glory it should be in the Lord. 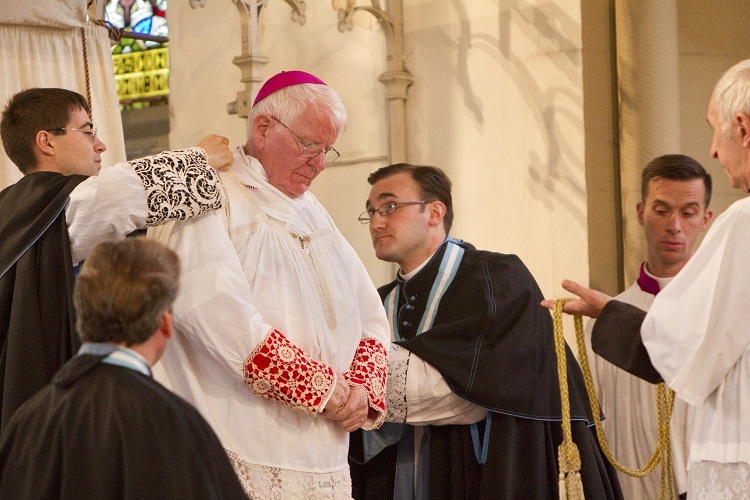 So it is therefore, first and foremost, with a profound sense of gratitude to almighty God that we are here today to witness the beginning of a new phase in the history of this venerable church of Saint Walburge. 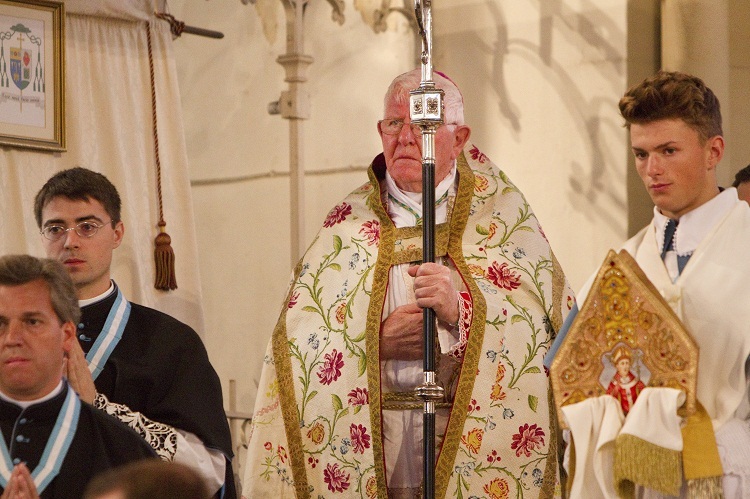 To pick up the image of Christ in the gospel parable, in recent years, for a variety of reasons, there has not been as much oil as we would have wished for in the lamp that is St. Walburge’s church. 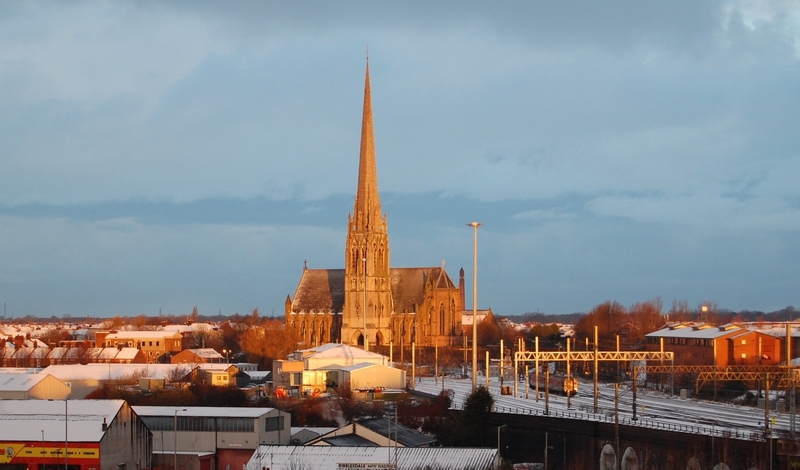 The city of Preston has rightly taken pride in its long Catholic and Christian history, and a powerful symbol of that history has been St. Walburge’s, visible from near and far through its unique spire. 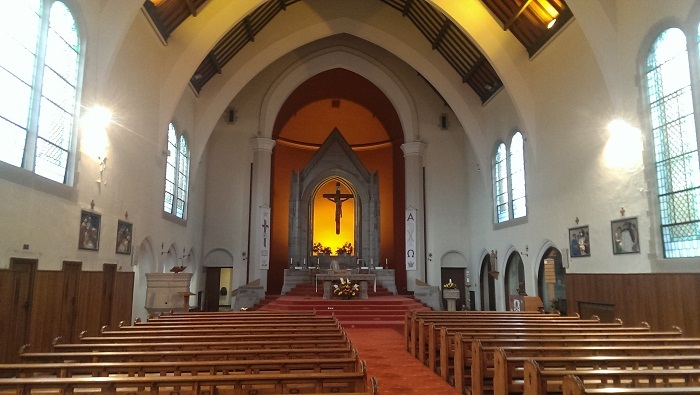 The question has often been asked during these last decades, what is the future of St. Walburge’s, will it continue and remain open as a house of prayer and worship as originally envisaged by the founding Jesuit fathers over one hundred and fifty years ago? Our presence here today and the fresh initiative now starting give a definite yes to that question. 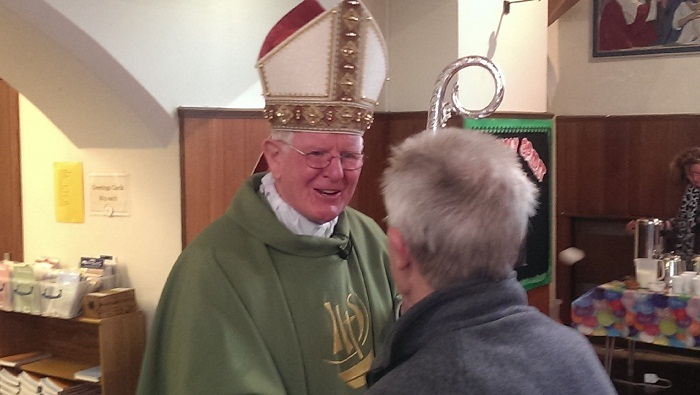 St. Walburge’s assuredly has a future for which we thank God, the giver of all good things. 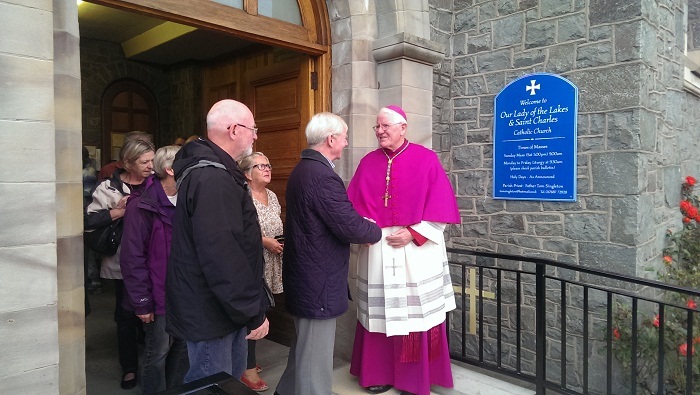 The church will now be open every day of the week to cater for the spiritual needs of those who pass through its doors. 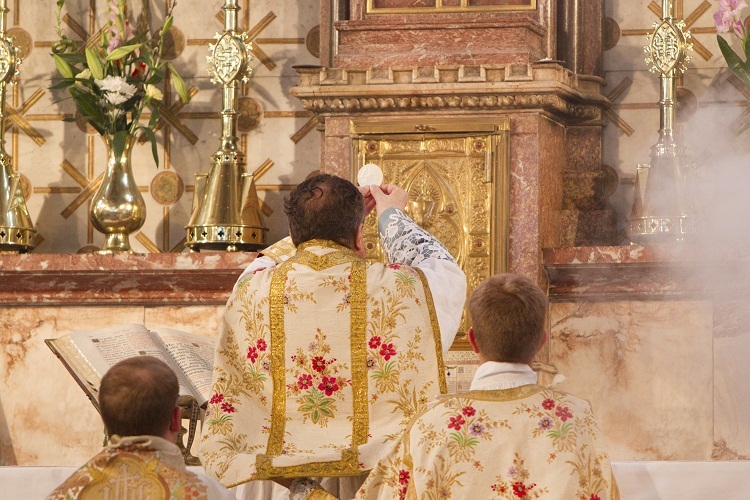 Mass will be offered daily, there will be the opportunity for quiet prayer and adoration, with regular access to other sacraments and religious devotions. 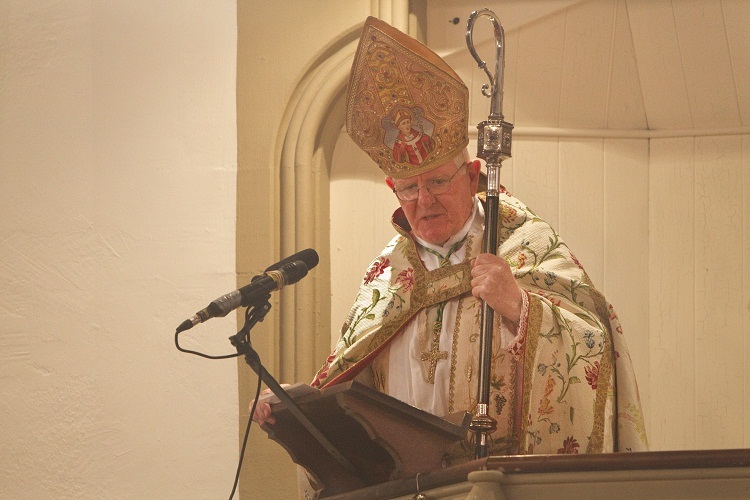 St. Walburge’s church will again become a much needed spiritual presence, and hopefully a beacon, in this part of Preston where the human spirit will find comfort and strength in our often confused and troubled twenty-first century world. The new venture now beginning in this magnificent church cannot but bring down blessings from heaven on the city of Preston. 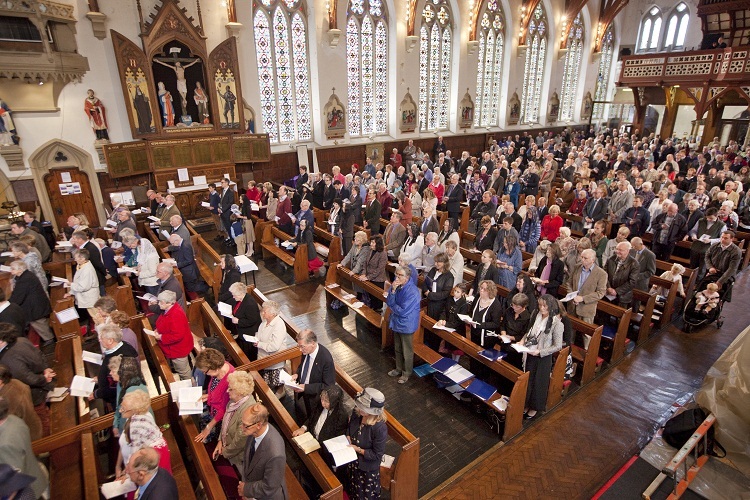 The common good and the city of Preston will indeed be well served by the worship and prayer that takes place daily here in St. Walburge’s. 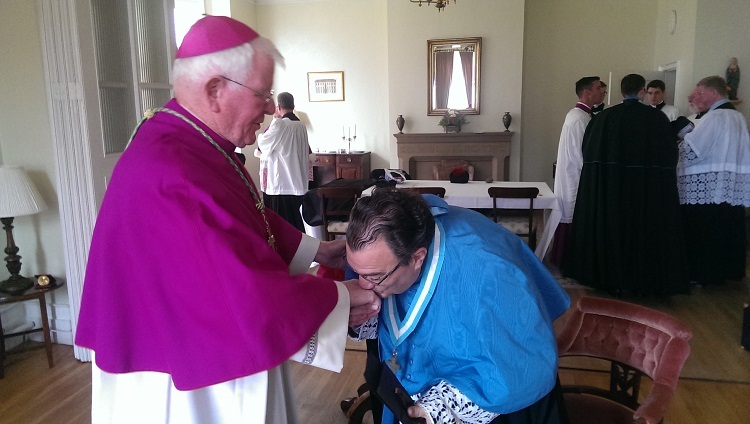 From today another page in the history of St. Walburge’s is being turned and written, made possible by the gracious and willing generosity of the Institute of Christ the King Sovereign Priest. 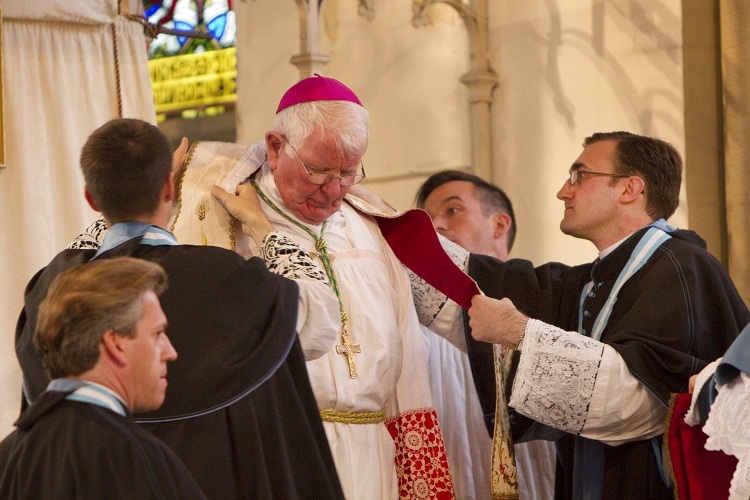 The Institute has accepted responsibility to ensure that St. Walburge’s continues to remain what is was intended to be – the house of God and a place of prayer for all people. 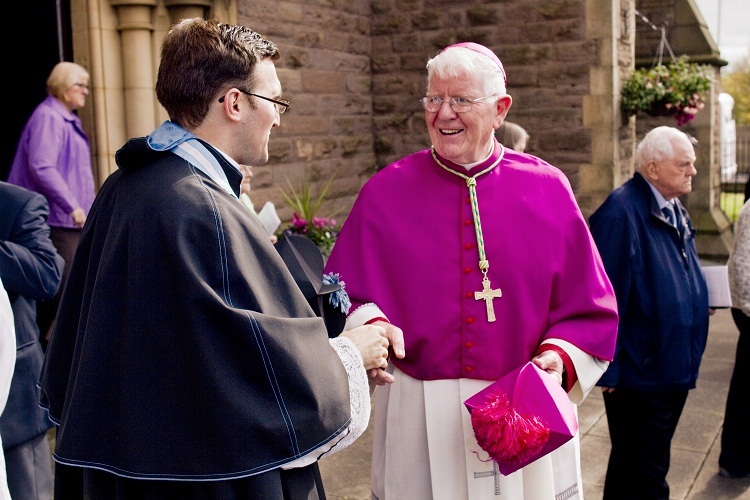 As Bishop of Lancaster, conscious and grateful to the generations of clergy who have ministered here down the years, I thank most sincerely Mgr. 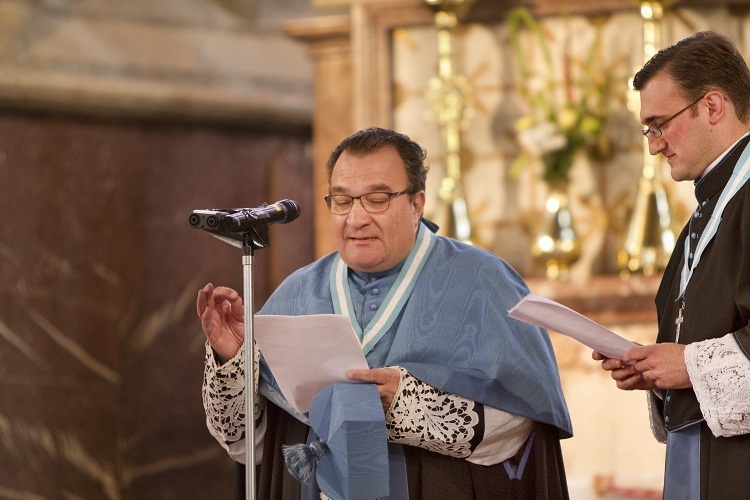 Gilles Wach and the Institute of Christ the King Sovereign Priest for their acceptance of my bold and heartfelt appeal to assume responsibility for St. Walburge’s. 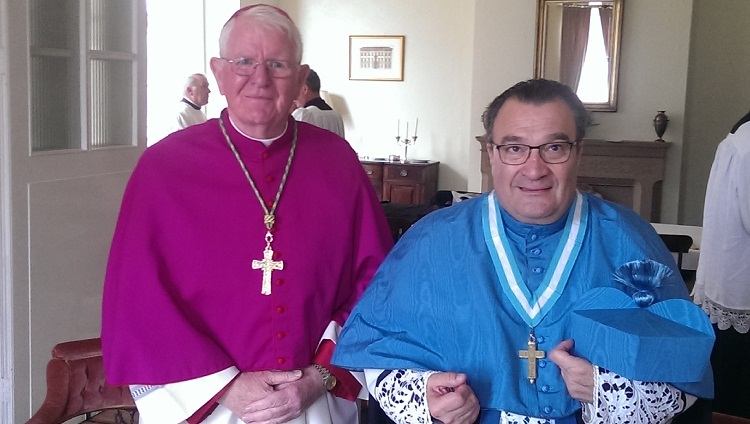 I also place on record the cooperation of Canon Amaury Montjean from the Institute’s foundation in New Brighton, Wirral, who has made every effort to ensure that the necessary negotiations with my clergy and diocesan officers have been smooth and trouble-free. The gospel parable highlights the wise virgins who stayed alert with oil in their lamps and so were ready to meet the bridegroom at whatever hour he came. The Church universal is constantly on the watch for Christ her bridegroom. 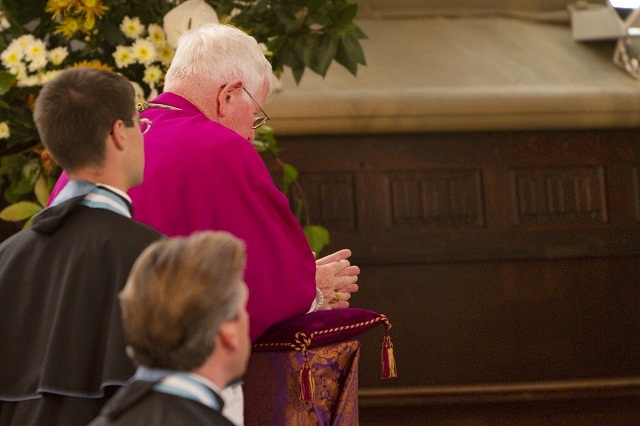 The sacramental and spiritual nourishment – like that oil of the wise virgins in our gospel – which St. Walburge’s will offer to Christ’s people who gather for worship will ensure that they are equipped to meet Christ as he comes to them in the events of their everyday lives. 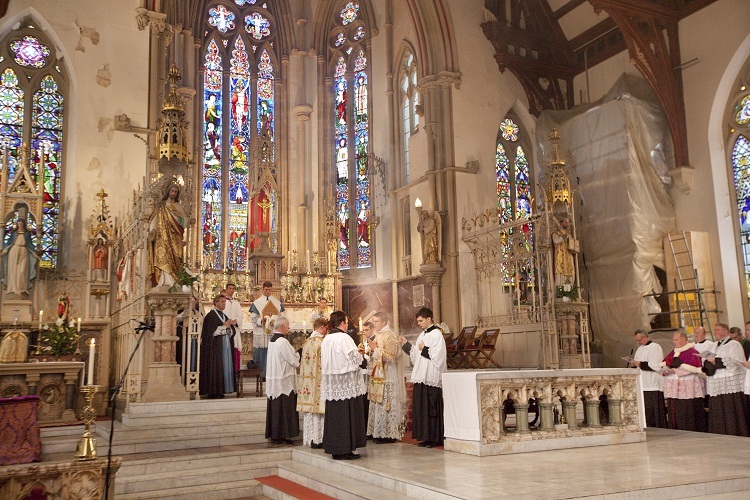 Mindful of the faith and commitment of the past generations who have gathered and worshipped almighty God in these sacred surroundings since 1854, we offer sincere thanks in this Mass for their legacy of this beautiful building. 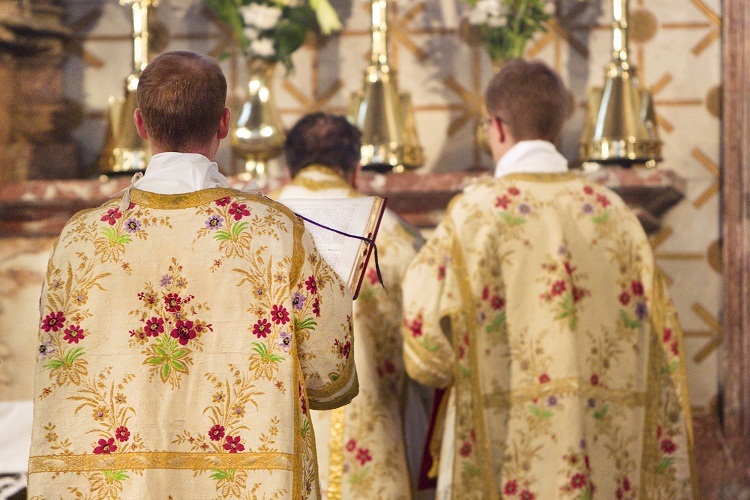 The large and impressive congregation, notable for its devotion, reverence and silence during this long liturgy, is an indication of the attraction the traditional Latin liturgy retains for many Catholics.